Year over year home sales shot up 33% in September when compared to the same month one year ago. This third quarter ending surge means that the Tallahassee real estate market has posted 3% more homes sold through September of this year than we did at this time in 2013. Considering that last year was a very strong first year of the housing market recovery, it is great to see a continuance remain in effect after such a strong year. The real estate graph below measures the relative change (either positive or negative) in the number of home sales recorded in Leon County each month, compared to the same month in the prior year. If there were more sales in the current period, then the blue line will extend vertically above the "0%" level, while the opposite is true if fewer sales were recorded. By way of example, the 391 homes sold in September 2014 was 33% more than the 294 recorded in September 2013, so that is why we see the positive result for this past month. When looking at post months, the compounded sales for the most recent 6 months were lower than the same period in 2013, thus we were concerned that 2014 might "give back" some of the gains captured in 2013. 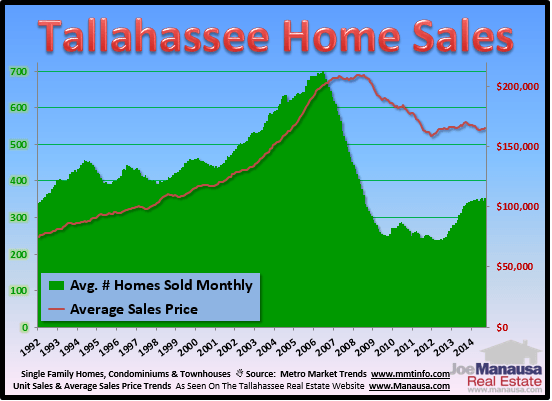 Even though this past months was a nice lift, the Tallahassee real estate market still has a long way to go before we can claim a recovery has completely occurred. 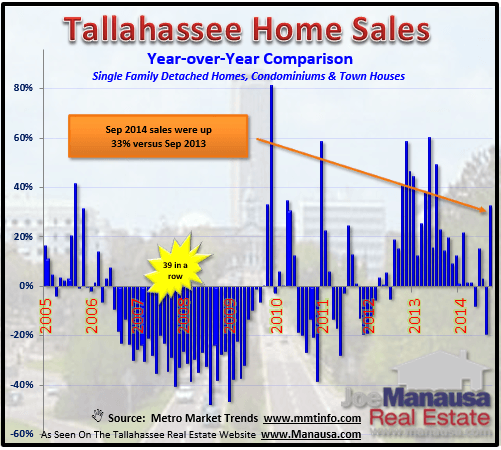 Our next graph provides a wonderful insight into buyer activity in the Tallahassee real estate market. The red line shows the one-year trend of home prices, but it's not the "meat" of the report. Each green vertical bar measures the average number of homes sold each month over the past year, and this data has been recorded since 1991. Currently, the rate of home sales is the same as what was recorded in 1993, a time in which the population of Leon County, Florida was roughly 30% less than it is today. This implies that there is pent-up demand, and I suspect we'll be seeing those green columns move above 500 in the coming years. Right now, there is a catch-22 slowing the housing market from a full recovery. There is a segment of the normal buyer pool that must sell a home before they buy, but many in this group have no equity in their homes due to fallen values. As home values recover, the pent-up demand will be able to enter the market and we will see more the market blossom to levels last seen at the beginning of the housing market expansion phase. If you would like to know how to make the most out of this market before it returns to "normal" (and before interest rates rise), just drop me a note and we can schedule a time to talk about your situation and specific needs.